Did climate change begin with industrialisation? How do we identify ‘bad’ climate change? Climate change, once a phenomenon known only to climate scientists, is now well-known even among school students. Along with growing awareness about its ill-impacts, the disagreements between developed and developing nations on cutting emissions are showing no signs of ceasing. Nations want global reduction in emissions but aren’t ready to cut their own emissions to the required extent. The recent UN climate summit at Lima has shown how it's going to be difficult to arrive at the desired climate deal in Paris later this year. Climate projections by various climate models continue to show how erratic weather is likely to be. PRECIS (Providing REgional Climate for Impact Studies) is one such high resolution climate model developed by the Hadley Centre of the Met Office, UK. This model was run at the Indian Institute of Tropical Meteorology (IITM) in Pune to project changes in the climate of India during the summer monsoon period (June-September) in the near future. A paper by K Krishna Kumar and others has examined these projections over three time periods: 2011-2040, 2041-2070 and 2071-2098 (considering 1961-1990 as the base period). From left to right (from 2020s to 2080s), we see blue shaded regions increase over central India. Blue shade here indicates an increase in rainfall by 4 to 12 mm/day (see the scale) in the projected period. This indicates that central India will likely see more intense rainfall in the near future due to the impacts of global warming. When did climate change start? And what makes it a high priority subject today? That climate change began only recently is a major misconception today. We must understand that natural climate change happened in the past too. In fact, it has been taking place for at least 800,000 years! Almost 90 per cent of the Earth’s ice mass is in Antarctica. Due to significantly low temperatures, there is huge accumulation of snow which gets converted into layers of ice over time. Different layers form at different periods of time. Each layer gives an idea of environmental conditions like the concentration of gases in the atmosphere, the amount of volcanic ash in the air and the temperatures corresponding to that time period. Scientists extract cylinders of ice from ice sheets or glaciers which are called as ice cores. They are just like memory cards preserved under ice. When extracted and decoded, they reveal details of conditions that existed in the past. In 2004, scientists drilled to a depth of 3,260 metres into Antarctic ice and extracted an ice core dating back to 800,000 years. This technique is analogous to the carbon dating technique used by archaeologists. 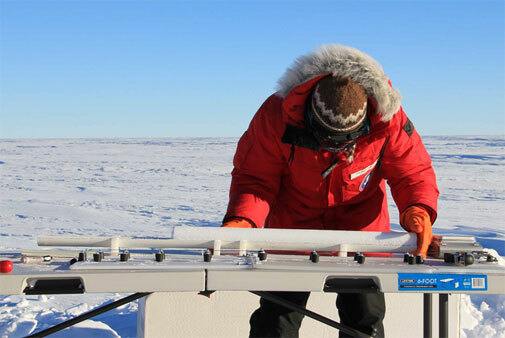 See here how the ice core is analysed. Temperature on Earth depends on energy from the sun. It is determined by the difference between the energy that comes in (input) and energy that is reflected back (output). The amount of radiation we receive from the sun keeps changing. Factors like slight variations in the earth’s orbit, solar cycles and changes in the fraction of radiation reflected by clouds (known as Albedo) affect input solar radiation. Increase in the temperature of surface air increases the concentration of greenhouse gases in the atmosphere, which in turn amplifies changes in the surface temperature of Earth. Higher concentration of greenhouses gases trap more radiation which is reflected by the Earth’s surface. This is how a positive feedback loop works. The graphs above show a positive connection/feedback between temperature differences at Antarctica v the concentration of carbon dioxide in the Earth’s atmosphere. When there is an increase in the temperature difference, an increase in carbon dioxide concentration is observed (and vice versa). 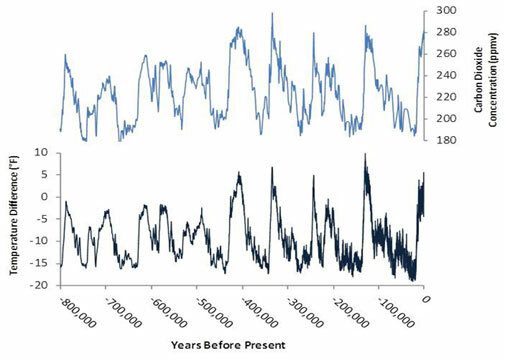 The peaks in both the graphs almost belong to the same period indicating a high connection between the two. This is how climate has been changing naturally. Carbon dioxide concentration levels bounced between 180-300 ppmv (parts per million by volume) in the past. We know that climate has been changing naturally. But now, it's changing anthropogenically, which means that there was a period when anthropogenic factors took over natural factors. 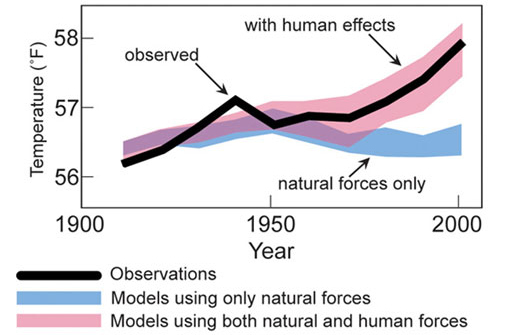 The figure above shows that since 1950, there has been an upsurge in the solid black line which now lies in the pink region, implying that such an upsurge can be explained by human effects only. Due to the industrial revolution, concentration of gases like carbon dioxide is rising (almost linearly over a larger period) from 1950 and is touching new heights every year. As per National Research Council (NRC) of the US, atmospheric carbon dioxide concentrations have increased by almost 40 per cent since pre-industrial times, from approximately 280 ppmv in the 18th century to 390 ppmv in 2010. 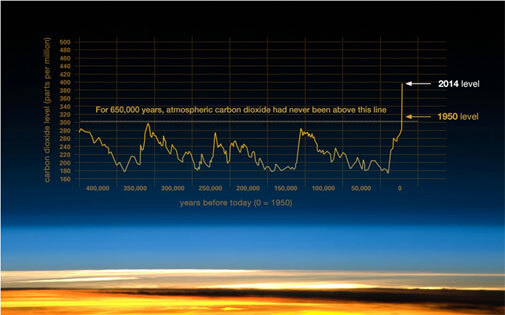 The current carbon dioxide level is higher than it has been in at least 800,000 years. Some volcanic eruptions released large quantities of carbon dioxide in the distant past. However, the US Geological Survey (USGS) reports that human activities now emit more than 135 times as much carbon dioxide as volcanoes each year. Human activities currently release over 30 billion tonness of carbon dioxide into the atmosphere every year. A tremendous increase in the concentrations of gases like carbon dioxide, methane, nitrous oxide and chlorofluorocarbons, a significant rising trend and no effective climate deal to cut down emissions have made climate change a matter of serious concern today. In my next blog, I will describe how climate change is changing the frequency of tropical cyclones in the north Indian Ocean. 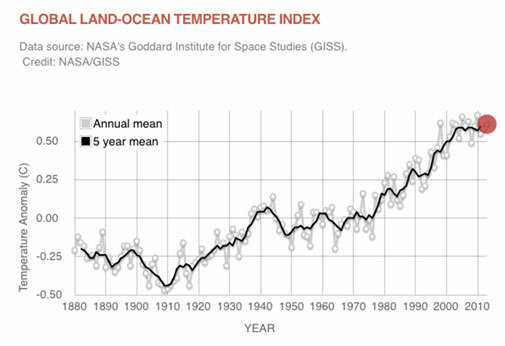 The above write up and the graph showing 0.61 C anomaly in 2013 does not show the base year on which these temperature anomalies are calculated.